Each musician has experience playing in trios. For Blessed (Origin Records, 2013), the leader wanted to distinguish this lineup from others. 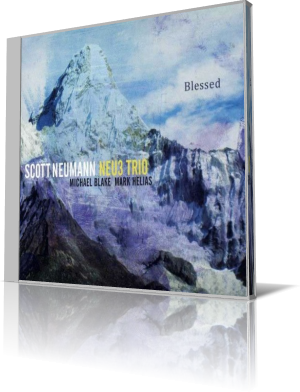 Thus the name Scott Neumann Neu3 Trio. The trio consists of Scott Neumann, drums; Michael Blake, tenor and soprano saxophones and melodica; and Mark Helias, bass. The title song is an upbeat, snappy tune. After an introductory sequence that mostly features bass and sax, the trio engage in a series of tightly syncopated phrases. Neumann is largely content to play subtly underneath the sax, with Blake being out front much of the way. He puts the tenor through some spirited lines. Helias is firmly engaged throughout. And Neumann, though mostly in the background, still manages to show off his dexterity on the kit, especially during the peak of the tenor solo. “Clamba,” one of the longer pieces, features Helias in a perpetual stair step rhythm, sometimes descending rather than ascending. Blake goes to town on the tenor while Neumann punctuates each line. About three minutes in, the sax goes silent, and the drums tone it down. This is for Helias to go exploring, which he does, aided by some emphatic tom rolls. The Brooklyn-based Neumann composed eight of the 10 tracks on Blessed. Helias contributed one song, “Brothers.” The songs vary from just over four minutes to a tad under eight. That avoids the monotony of having too many tracks at some arbitrary running time, gives the musicians room to stretch out – and the listener the opportunity to fully soak in the sounds – but without going on too long. Blessed is not for the faint of heart. It can and should be appreciated by anyone with an open mind and a taste for solid composition and solid play. However, those locked onto the more catchy, four-minutes-per-song pop instrumentals may need a defibrillator after a few minutes of this.